We kicked off our travel season early this year. Both of us had some free time on the first week of the year so we were looking for a destination within easy driving distance that we hadn’t visited in a while. Ultimately we selected Minnesota’s Twin Cities and hit the road on January 2nd for a four-night Tuesday through Saturday getaway. On the way up we planned a one-night stop in Eau Claire, Wisconsin. This small city of about 68,000 has been experiencing a renaissance, with hometown band Bon Iver and the yearly Eaux Claires music festival bringing added attention. We chose the ultra cool Oxbow Hotel for our accommodations since it looked right up our alley. It is a thoroughly remodeled mid-century motor court full of thoughtful details for today’s trendy travelers. Rooms are contemporary and spare, with functional furnishings and local screen print artwork. It’s like Etsy meets IKEA. Each room also contains a record player for which guests can check out albums from a collection in the lobby. It’s a nice touch, and there are instructions in the lid to remind those of us who are just barely young enough to forget how to use a turntable. We spun Fleetwood Mac, Sufjan Stevens and The Highwaymen. 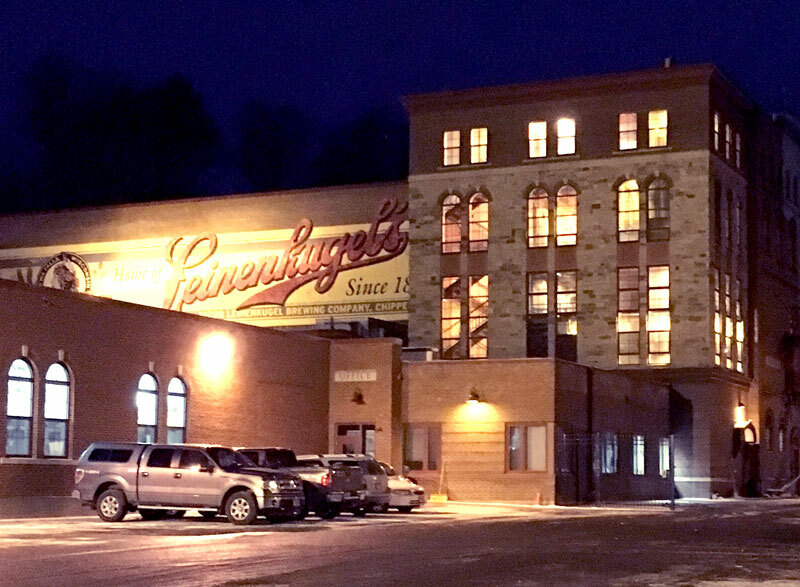 Just a 20 minute drive away in Chippewa Falls is the famous Jacob Leinenkugel brewery. We arrived at the Leinie Lodge tasting room and gift shop just in time to join the day’s final brewery tour. Our guide led us through the historic multi-floor complex explaining the brewing process and the company and family history. It ranks among the oldest brewing companies in the country today and despite being owned by MillerCoors, still has Leinenkugel family members running the show. As far as brewery tours go it was pretty typical, but the real highlight was seeing the bottling and packaging process in operation. Frequently when we tour breweries it’s during non business hours when nothing is moving, but here we got to see the bottles getting filled, pasteurized, labeled and boxed, ending in a giant room with hundreds of thousands of bottles of beer stacked to the ceiling. Back at the Leinie Lodge our tour wristbands allowed us 5 sample pours of any Leinenkugel beers currently on tap. Back in Eau Claire, the Oxbow Hotel is also home to what could be the trendiest restaurant in northern Wisconsin, The Lakely. The concept is advertised a midwestern comfort food featuring locally sourced ingredients, spirits and beers. 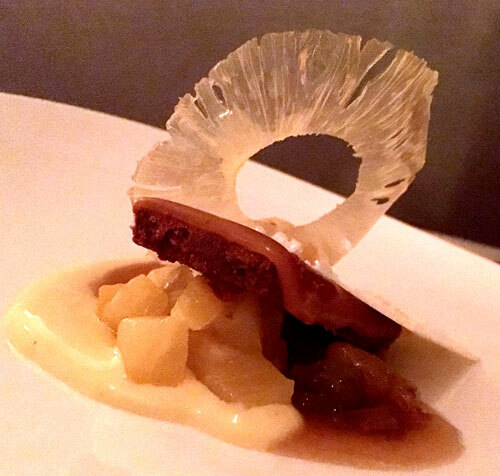 The regular menu looks delicious, but we inquired about the six-course chef’s tasting menu and were instantly sold. Our server informed us that this option is so unique and variable that different tables ordering the menu on the same night might receive very different dishes. It’s all determined by how much of any given ingredient is available and how many are in your party. The whole Oxbow/Lakely complex is going to be a strong contender for best lodging and dining of the year … and we stayed there on January 2nd. The following morning we walked a few blocks south on Barstow Street for breakfast at The Informalist before driving the last hour to the twin cities. Our first stop after crossing the St. Croix River was the Minnesota State Capitol in St. Paul. Free Guided tours of the ornate 1905 building start at the Information Center at the top of the hour (schedule varies seasonally). 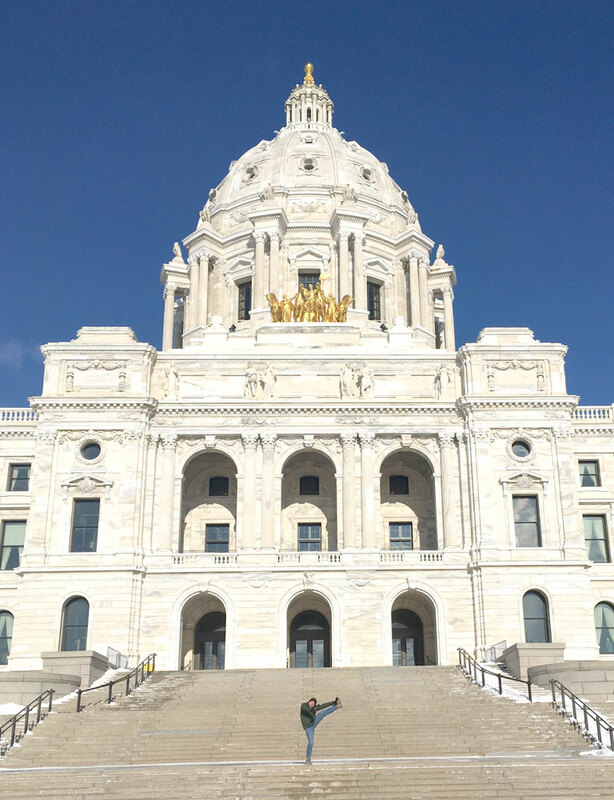 At the turn of the 20th century, Minnesota wanted to make a statement with their new capitol building, so architect Cass Gilbert designed the world’s second largest self supported marble dome in gleaming white and dressed the interior in multi-hued varieties of Minnesota stone. The informative guided tour took us through the major parts of the building, including the House of Representatives, Senate and a chamber used by the Supreme Court. After it was over, we were encouraged to continue to wander about the building to check out more artwork. With that welcoming introduction to Minnesota, we got back in the car and headed west. It’s unusual to see two large downtown skylines so close together, but just over eight miles away from St Paul lies the larger and more famous of the twins, Minneapolis. The buildings sparkled as we drove in on that frigid day. There must be more reflective glass per capita in Minneapolis than any other city in the country. The last time we were in town was on a couple of balmy days in July 2009, so this season was a marked contrast. Unsurprisingly, hotels are extremely cheap during the first week of January in these parts. Through Hotwire, we were able to stay in the very center of Downtown in the swanky Kimpton Grand for under $100 per night. We basically had our own apartment, with a comfy bedroom and an enormous marble-tiled bathroom at least three times the size of ours at home. The mesmerizing patters of glass and steel at Crystal Court at the base of the IDS Center. The Kimpton is connected to one of Minneapolis’ most unique features, the skyway system. Throughout downtown, more than 9 miles of glassed-in, second story passageways connect 80 blocks of buildings and allow residents and workers to go about their business sheltered from any sort of inclement weather. It was a brisk 5 degrees outside, but office workers hustled around without jackets. Each building has its own skyway design, with some leading into huge atriums lined with shops and restaurants and others twisting and turning confusingly. My first attempt at a skyway shortcut involved getting slightly disoriented and ending up on the street just one block from where I started. Once we got the lay of the land, we used the system to get to many of our destinations, even throwing in a quick shopping trip to the Target “mothership” and stopping to marvel at the IDS Center‘s Crystal Court atrium. Our cultural calendar was more packed than on our average city visit. The Mill City Museum is a great place to get an introduction to Minneapolis and the major industry that made it a boomtown. The museum envelops the ruins of the Washburn A flour mill that was once the largest in the world before deteriorating for years and then burning in 1991. Displays educate visitors on the history of Minneapolis, the milling process and harnessing water power. A freight elevator called the “Flour Tower” lifts guests up and down past historic re-creations of a working mill. It culminates at a 9th floor viewing platform overlooking the mill ruins and the Mississippi River. 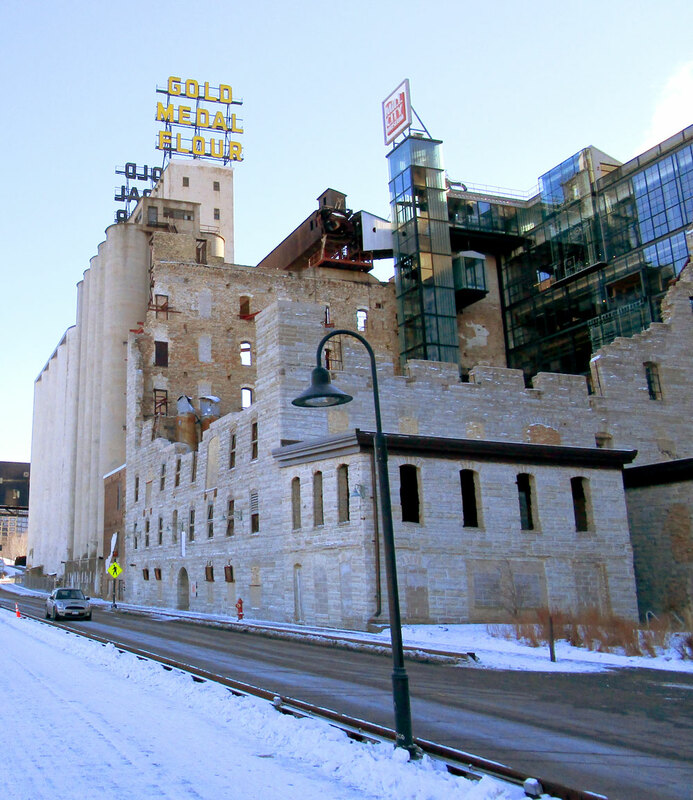 From the 1880s to 1930s, Minneapolis milled more flour than any other place on earth. Wheat flowed in from farms on the western plains and St. Anthony Falls created the power to run the mills that refined it into flour. For decades, a mill district flanked both sides of the river in the center of the growing city. The industry decentralized and drifted away from downtown Minneapolis when electricity and improved transportation systems allowed factories to be located anywhere, but the industry and financial institutions that followed them to Minnesota left a strong business foundation that today makes the twin cities the largest business center between Chicago and Seattle and home to a high concentration of Fortune 500 companies totaling 17. All that business power has fostered strong cultural institutions. Minneapolis is said to have more theater seats per capita than any U. S. city other than New York. On that note, we planned ahead and bought tickets to an evening performance of Blithe Spirit at the renowned Guthrie Theater. The Guthrie was founded in 1963 as professional theater company performing in a repertory style with a resident acting troupe. 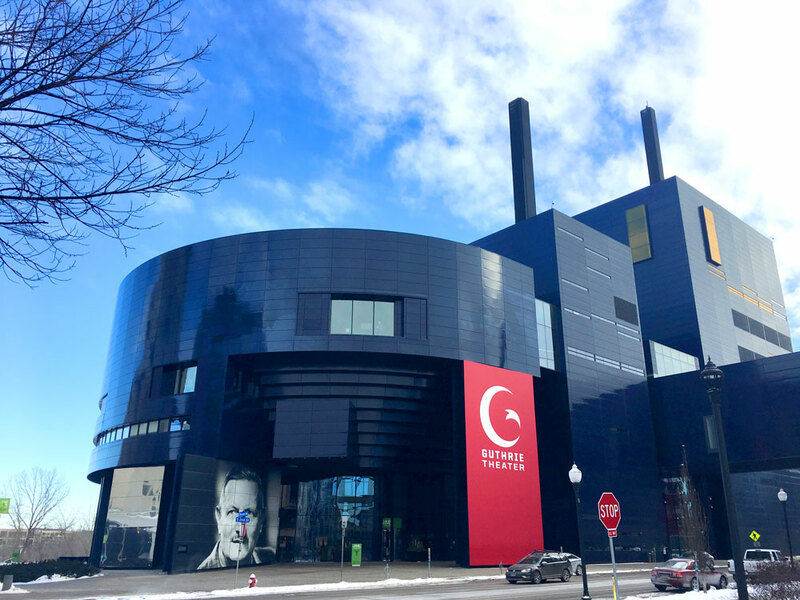 The play we saw was classic farce, but the Jean Nouvel-designed building is all drama, resembling a futuristic factory overlooking the River (right next to the Mill City Museum). Three different stages fill the building, with public spaces and lounges connecting them and offering unique views on the city outside. Orchestra Hall lobby and concert hall. On a whim, we checked the Minnesota Orchestra schedule and discovered they were performing a Tchaikovsky symphony and piano concerto on Friday night. We bought upper balcony tickets for a very reasonable price. 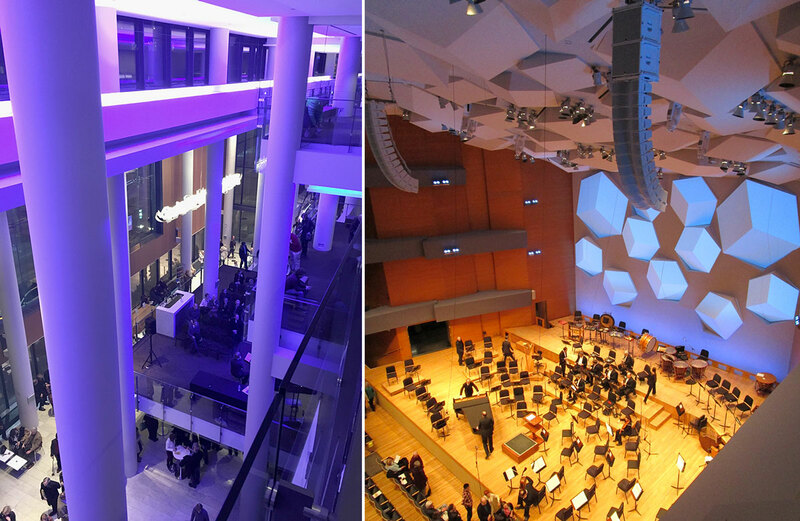 Orchestra Hall lies at the southern end of Nicollet Mall in downtown, and was recently remodeled and expanded. A modern, multi-level glass lobby overlooks the surrounding streets and holds spaces for hosting pre-concert discussions. The concert hall interior features a mesmerizing pattern of three dimensional polygons on the wall and ceiling for acoustic purposes. It’s definitely not your typical stuffy classical concert venue. Our seats were all the way toward the front, nearly above the musicians, which wasn’t ideal for visibility, but was a unique vantage point on the audience and concert hall. Checking out the local symphony might become one of our go-to cultural activities while traveling. Last time we were in town, we visited the Walker Art Center (Contemporary) and Minneapolis Sculpture Garden, both must-sees. This time we instead spent a morning at the Minneapolis Institute of Art, located just south of downtown in a Beaux Arts building dating from 1915. With additions made over the years it is currently the sixth-largest art museum in the country. The 80,000-piece collection spans 5,000 years of paintings, drawings, prints, textiles, architecture and more. As an added bonus, admission to the general collection is free every day. In between all our exploring, we spent a lot of time eating and drinking. Minneapolis could have one of the most underrated dining and cocktail scenes in the country right now. On our first evening, we headed to Northeast Minneapolis (which is actually located just north of downtown) and started with a couple pints at Dangerous Man Brewing. We had reservations next door at Young Joni, which has been getting a lot of attention for their wood fired pizzas and crossover Korean dishes. The Umami Mama pizza was fantastic and they also have a list of creative cocktails. We experienced the first of several cocktails in Minneapolis featuring aquavit, an herby dill-flavored Scandinavian liquor we enjoy (that should appear on menus more frequently than it does). Don’t pass it up if you see aquavit on a menu. Speaking of Joni’s cocktails, there is a back bar cocktail lounge that is open late, that we unfortunately didn’t have time to check out. On night two, we caught happy hour at the speakeasy-themed Prohibition Bar atop the landmark Foshay Tower. Before completion of the IDS tower in 1972, the obelisk-shaped Foshay stood as the tallest building in the city for 43 years. Today it contains the W Hotel Minneapolis and the bar now offers an eye-level vantage point on glassy downtown skyscrapers and beyond. Our dinner reservations that night were at Bardo, again in the Northeast Minneapolis neighborhood. Again we enjoyed all-around great food and atmosphere. For after dinner drinks we headed to Tattersall Distilling, which we read had a tasting room bar in their production facility. When we arrived we were surprised to find not a typical tasting room, but an enormous bar with a lengthy cocktail list featuring both classic and creative concoctions made with their own spirits. We again had drinks with vegetable juice as ingredients (beet and carrot), so we figure Minnesotans have found the secret to balancing booze and health. Post symphony on Friday night, we headed to the Warehouse District for a nightcap at Parlour, where we found a cozy vibe perfect for some cocktails and their tasty bar bite menu. On Friday afternoon after some shopping in the Uptown neighborhood, we were in the mood for beer and found our way to Lakes & Legends Brewing, a recent addition to Loring Park. You can’t go wrong with $3 happy hour drafts in a dog-friendly bar. Bonus points go to the teacher grading papers while drinking a beer. A+ execution, my friend. Since we were not practicing moderation at dinner and cocktail hour, we took it easy on breakfasts and lunches. We found a great little skyway coffee shop by our hotel called Peace Coffee and enjoyed donuts from Bogart’s Doughnut Co. in the IDS center Crystal Court. When we just needed a quick bite for lunch, Hen House Eatery hit the spot with soups. To fuel ourselves up for the long drive home, we googled “brunch St. Paul” and followed the directions to The Buttered Tin, which was crowded like a local favorite. We always take pride in finding the essence of everywhere we visit. 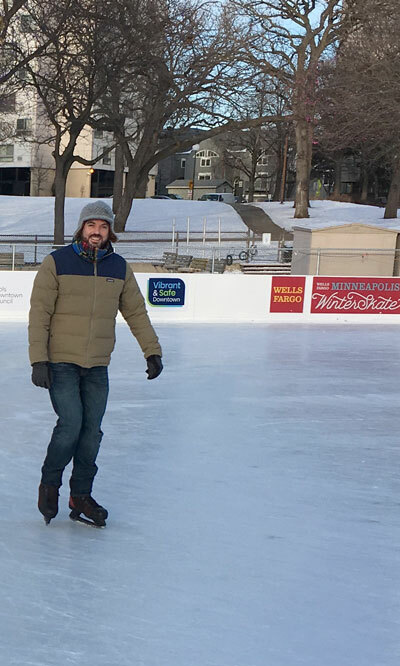 Maybe the most quintessentially Minnesotan experience we had was ice skating in Loring Park. It was exactly 1 degree Fahrenheit but we dressed appropriately, lapped the rink for a half hour and had a blast. That’s the great thing about Minnesota, even during the historic cold of our visit nobody was complaining. Everyone was out enjoying the art, culture and dining their city has to offer, and for that we’ll happily make a return visit anytime. This entry was posted in Destinations, Travelogues and tagged Best Minnesota Food and Drink, Chicago to Minneapolis, Eau Claire Dinner, Eau Claire Road Trip, Leinenkugel Brewery Tour, Minneapolis Bars, Minneapolis Road Trip, Minnesota Food, Minnesota State Capitol, Twin Cities Road Trip. Bookmark the permalink.